It's been a decent year for Jetfire. After a San Diego Comic-Con and HasCon reissue of the Legends redeco of the Thrilling 30 toy, now we've got a heavy retool of the Cyber Battalion Starscream [FOTD #1,413]. The figure has the same basic transformation and shares a few parts with Jetfire, but there are some changes - more than I would have assumed. The 7-inch tall features about 13 points of articulation and comes sock-tied to a cardboard slab in a closed box. 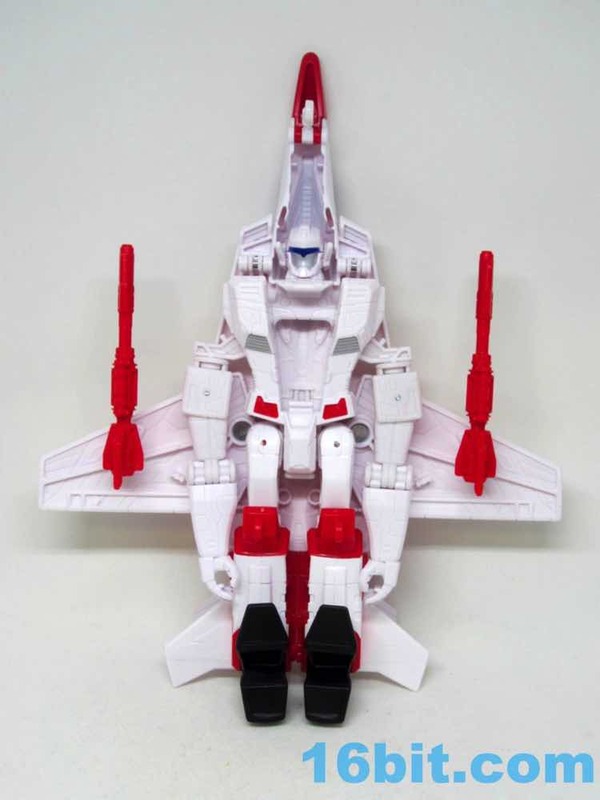 This may be good, as the sun can't yellow it, and it may be bad - because you won't know if it was yellowed. 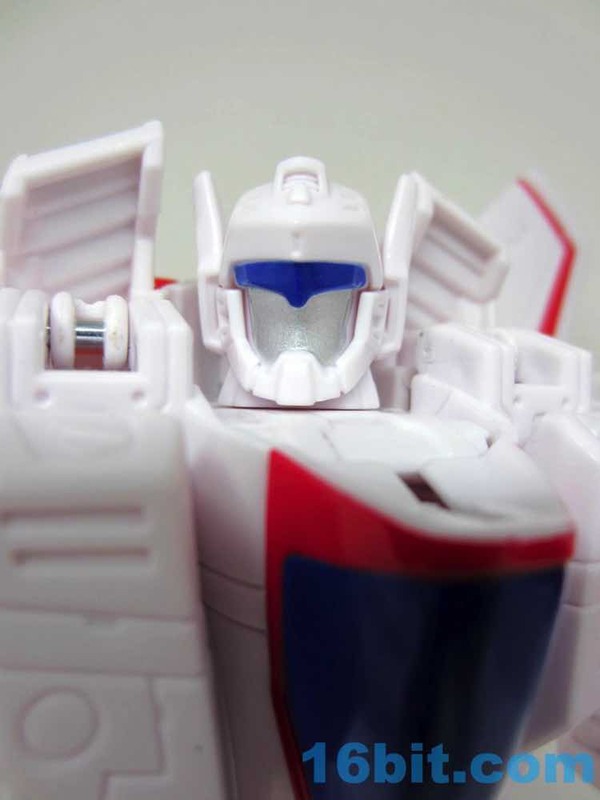 It's a charming toy that shares much of the body parts from your favorite Decepticon. 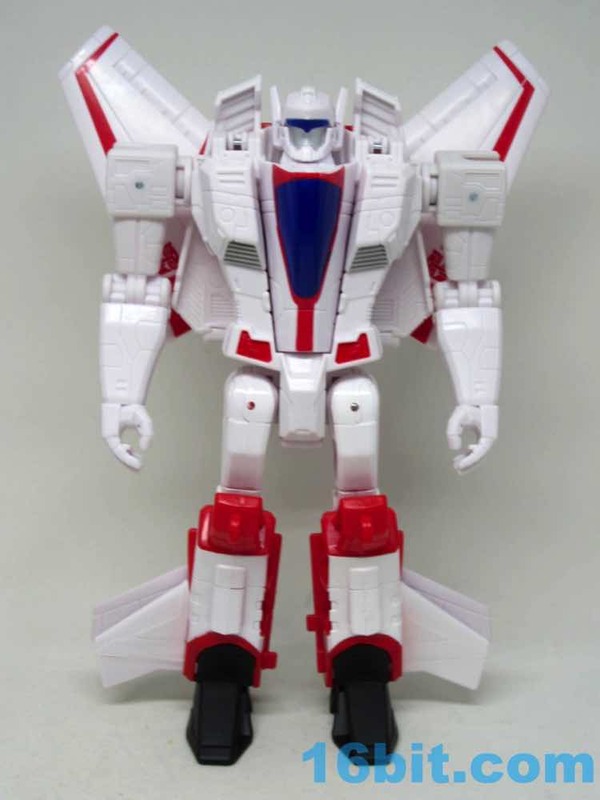 The head is new, the chest is new, and the rest is basically Starscream revisited. 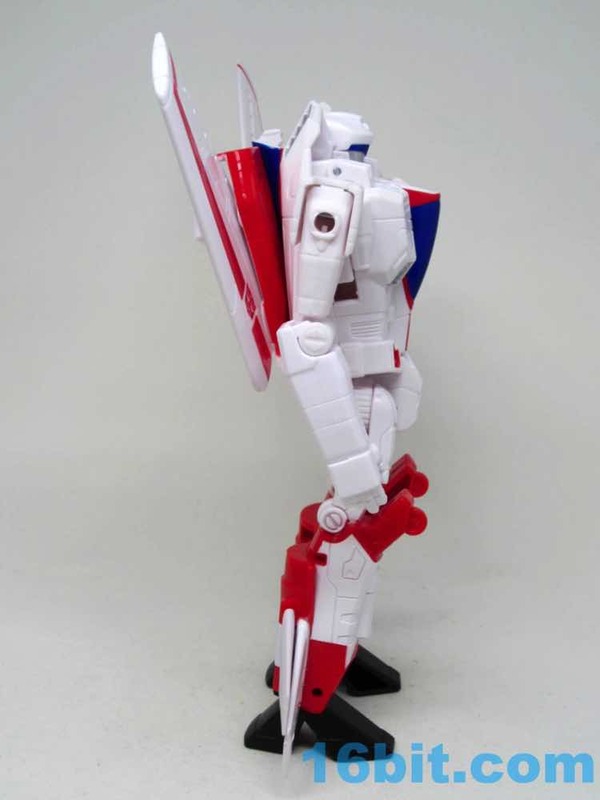 The wings have three different slots for the tabs to rest on the figure's back, allowing for locked-ish positions showing off different looks, or emotions if you think wings are expressive. My one gripe is his fists seem to hold the weapons at an angle, but you can also plug them into his shoulders Starscream-style. 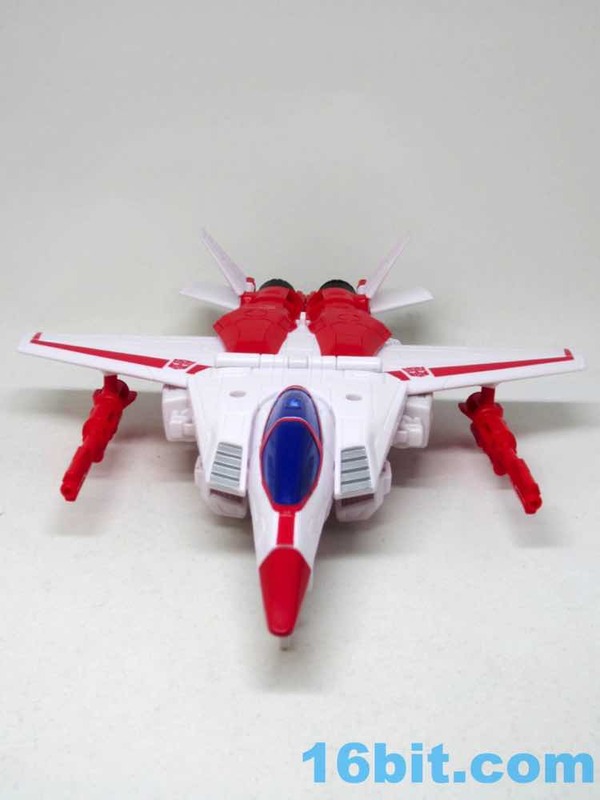 Transformation is a snap, but it's worth noting the helmet has articulated antenna that must be pushed down to transform into the jet mode. 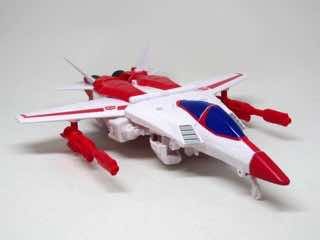 It's not a Veritech Valkyrie thing, it's a Seeker with new parts after you move the new wings and body sections in place. 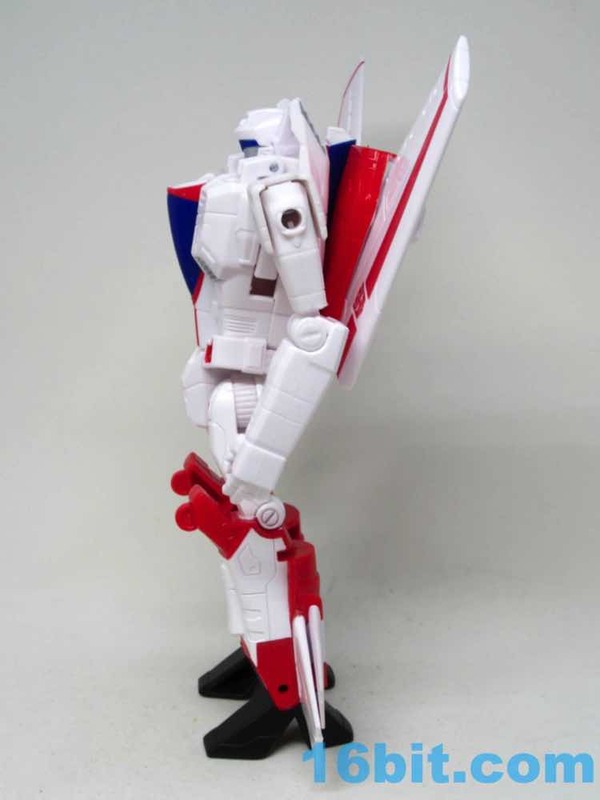 The feet fold in, the arms go down, and the panels flip nicely and easily. 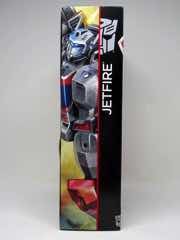 There are instructions on the box, but you likely will not need them. 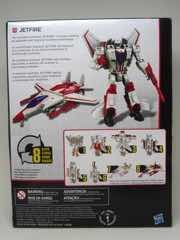 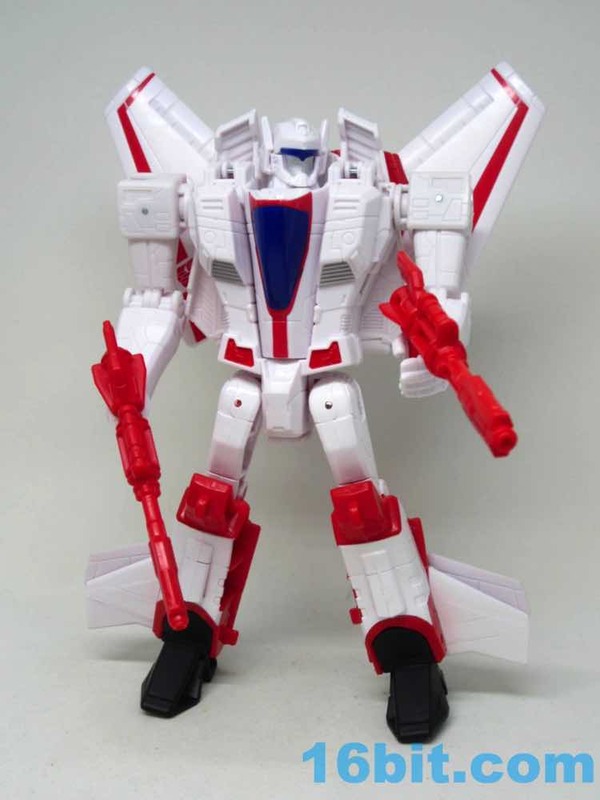 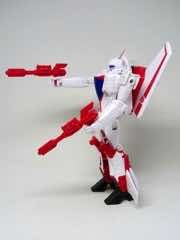 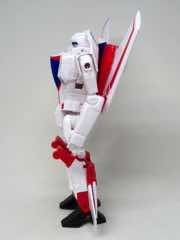 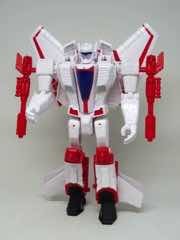 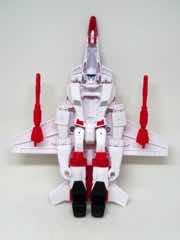 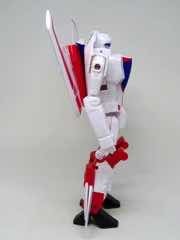 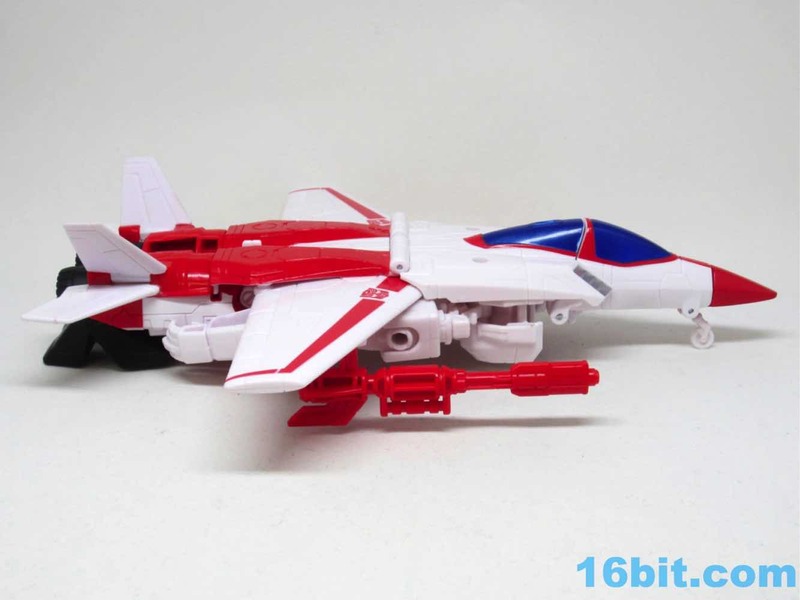 The jet looks a lot like Starscream in white, but isn't - the back engines and rear fins are. 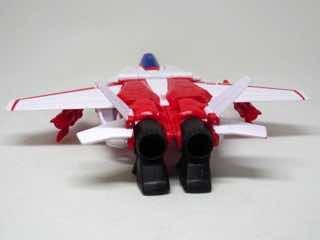 The nosecone and front of the canopy are. 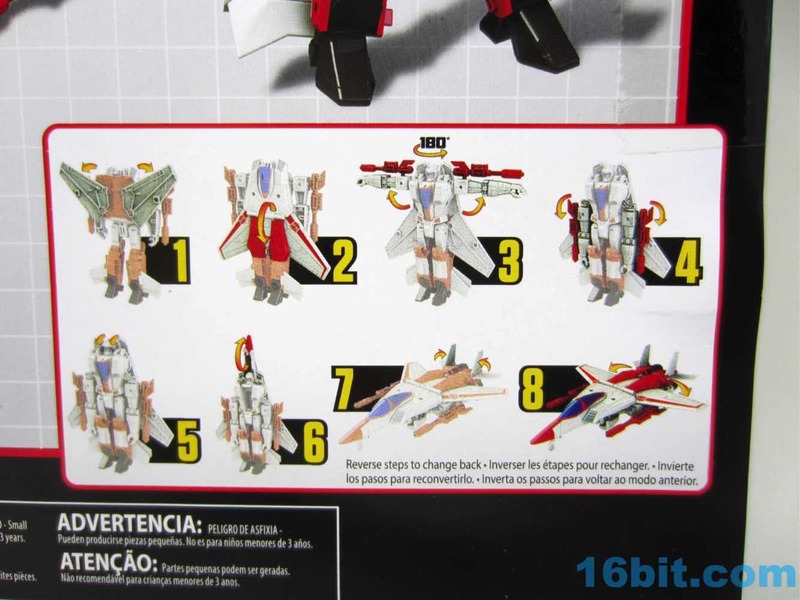 But the rest of the plane bits seem new, including the wings which can be tabbed into two different positions. 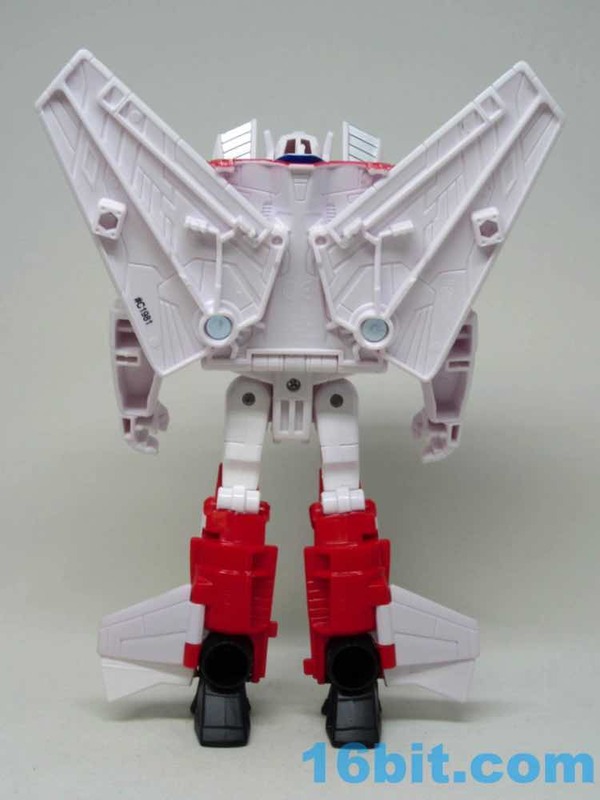 It's this kind of detail I'm surprised to see on what is supposedly a cheap line for kids... but you know and I know that collectors love these. There is also a landing skid, and you'll need it to keep the jet looking decent on a flat surface. 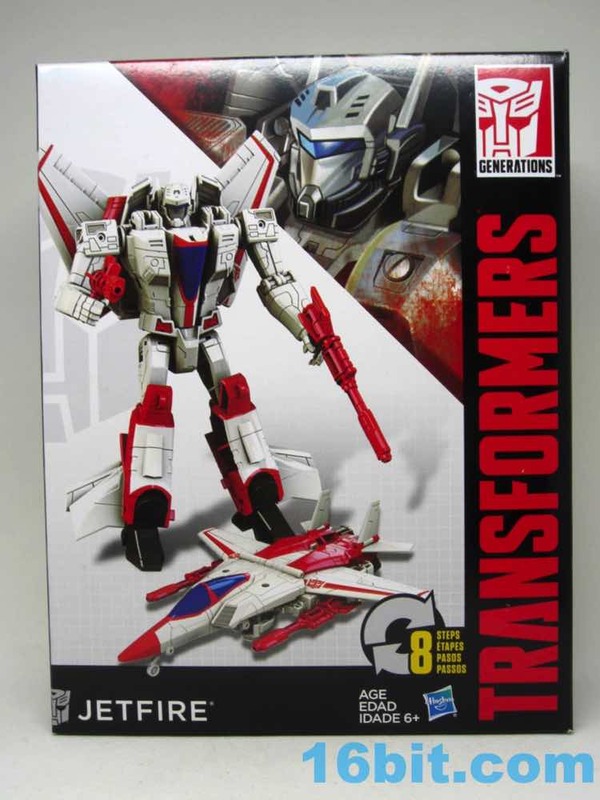 Despite the fact I already own two very nice Leader-class Jetfires, a Voyager-class Jetfire, and a decent R-Blade, I had to get this too. I'm loving the format and the bang for the buck, given that these cost about the same as a deluxe but are sized about the same as a Voyager. 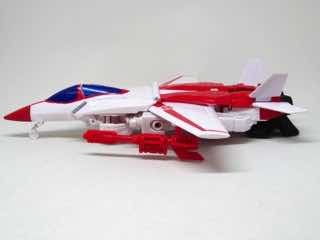 You lose some articulation and deco, but it's a fairly meaty toy for the asking price. 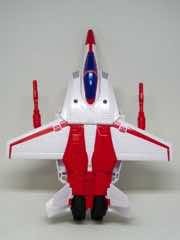 I sincerely hope Hasbro makes more of them, especially at the presently slow clip of a couple of new toys per year. I can't get sick of something if I can fit them all on a shelf. 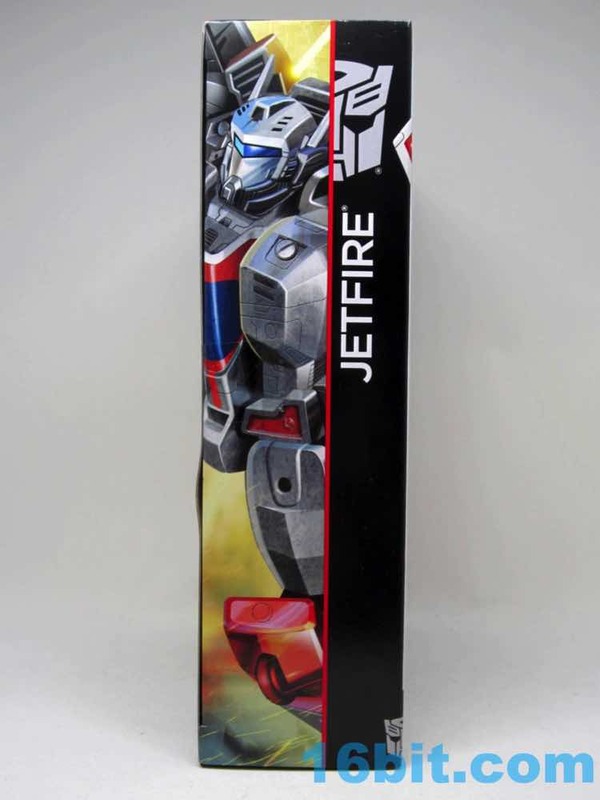 If you don't have a recent Jetfire, go ahead and treat yourself or someone you love. If I had to pick only one character from this line, Jetfire or Starscream, I'd go with Starscream.